The October Road: [OUTFIT] Mondays Are The Best! Ahh Monday... You're finally here! The day where I get to have the entire day to myself without having to think of anything else. :) We had a leisurely lunch, went to shop for cross trainers to replace my old ones and even had the time for a coffee break before I head to the gym. Been sick the past few days and I'm really glad that I'm finally better! Have been obsessed with finding the perfect throwover so you can imagine my joy when I finally found this cotton one with lace and embroidery details! 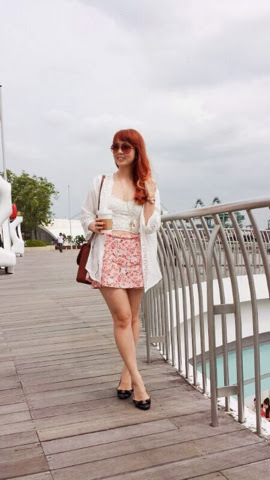 I layered it over my white lace bralet and floral skort for a feminine and casual Spring look.